It is true that the English language is a hard subject to study and understand. Contrary to what others believe in, the English language goes beyond the basic subject-verb agreement. Although they are fundamentals of the language, there are still other important and determining aspects that one needs to thoroughly study and clearly understand in order to have a strong and effective command of the language. It is important that you look beyond the surface, and have the curiosity to dig deeper in order for you to discover the wonders of the English language. But before you even start on that learning journey, you still need to make sure that you have the basics mastered. This means that in order to understand the complexity and profoundness of the more advanced aspects of the language, you need a strong foundation. You have to be knowledgeable about the about the basics in order for you to easily comprehend the concepts on the other more complicated components of the language. 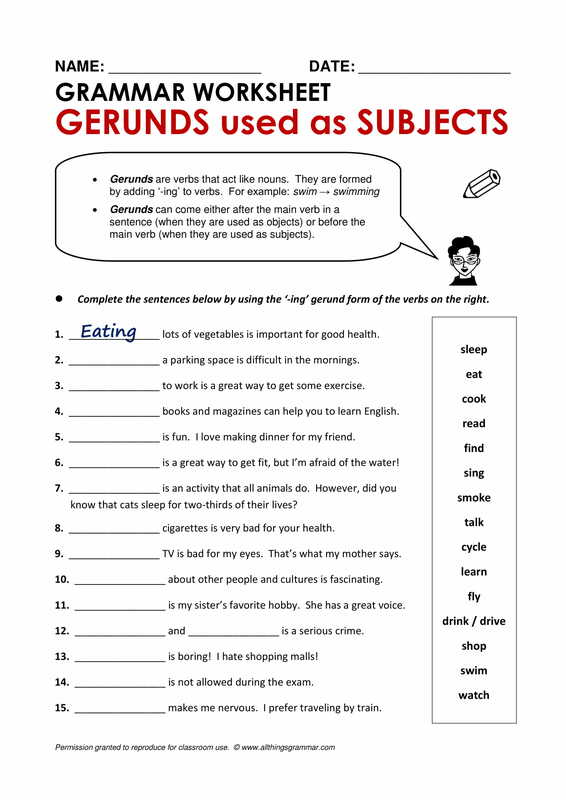 The word gerund originated from the Latin word gerundium, from gerundus which means to be carried out, with a future passive participle form of gerundive of gerō which translates to carry, bear. 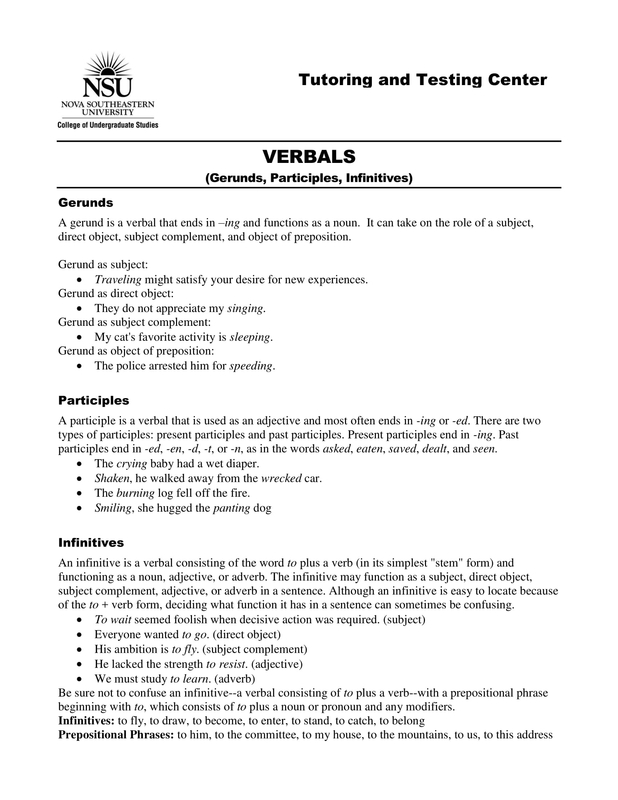 Gerund is defined as a verbal form that functions as a verbal noun. In other languages, specifically Dutch, Italian, or Russian, it is a verbal form that is similar to a present participle, but it functions as an adverb to form adverbial phrases or continuous tenses. Some people call it the -ing form of a verb. However, although it is a verb, it acts as a noun when used in sentences. There is no exception in the form a gerund takes, every verb that ends with -ing is generally a gerund. However, although they have a specific form, it can still get tricky to spot since the present participle form of a verb also ends with -ing. When you master how a gerund is used in a sentence, it will become easier for you to differentiate it from the present participle form of a verb. 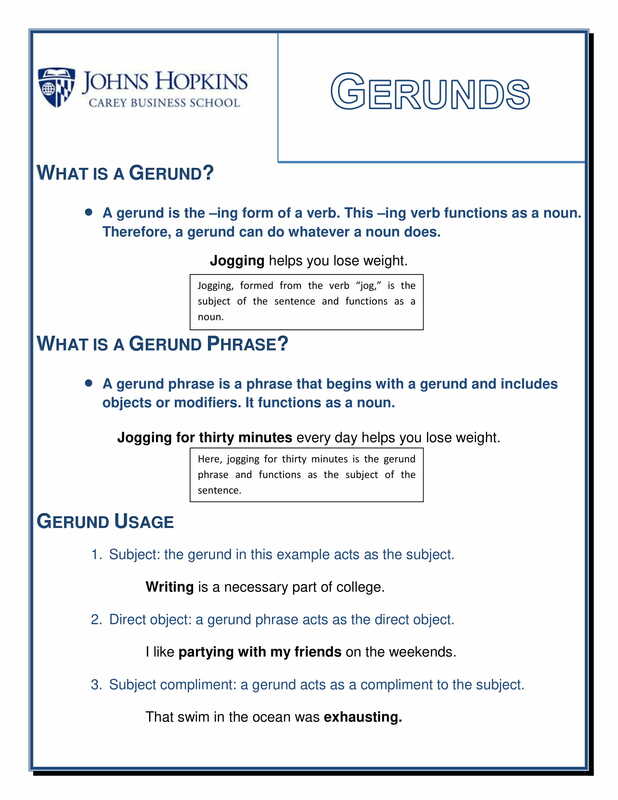 Since a gerund often acts as a noun, it takes the place of a noun in a sentence as well, namely as subject, direct object, subject complement, subject of preposition. 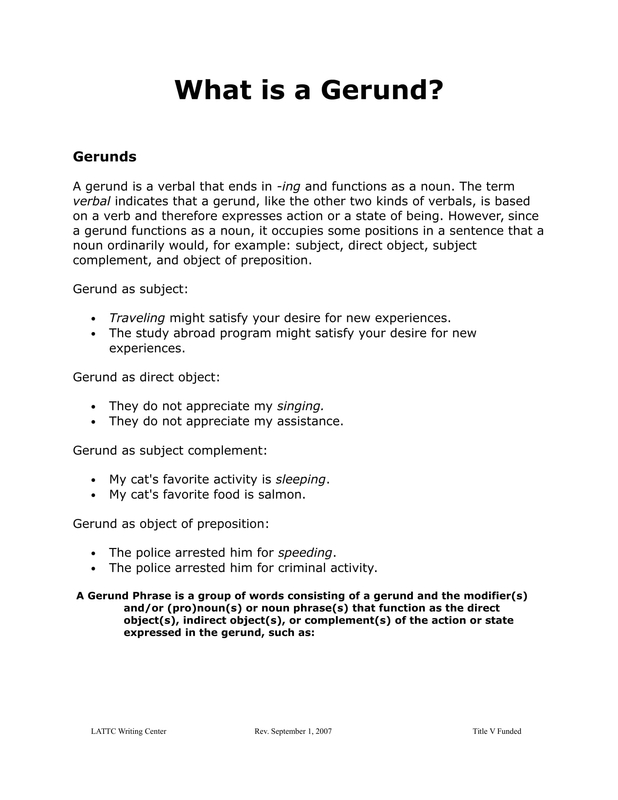 For example of gerund as a subject: Traveling is a fun experience. Normally, when you make a sentence, you always make sure that the subject of your sentence is noun—a name of person, place, thing, etc. However, like in the example, although a gerund is basically a verb, it acts as a noun; thus, it is grammatically correct to use traveling as a noun in the example. A gerund can also be used to aptly describe the purpose of something. For example: A vacuum is for cleaning. 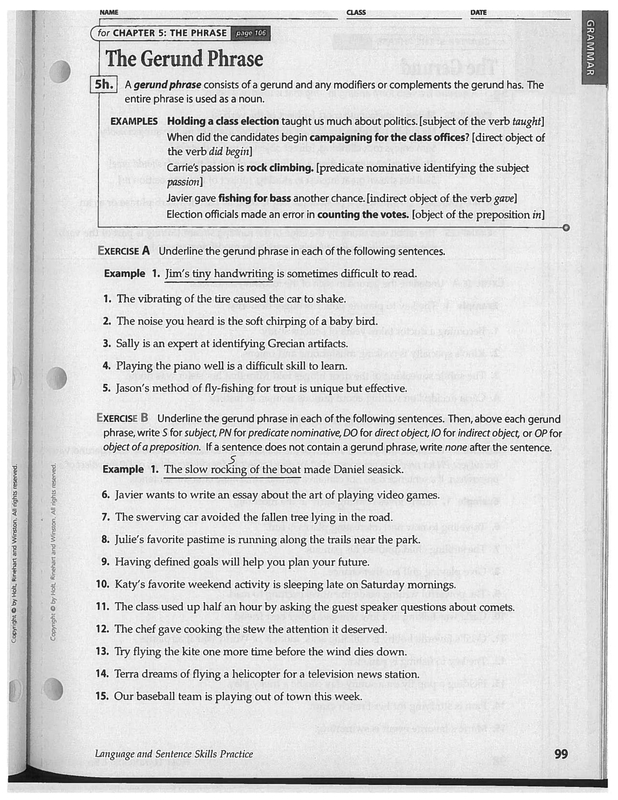 In this example, the gerund cleaning answers to the question “What is a vacuum for?” in order to accurately describe the purpose of the subject, which is the vacuum in the sentence. 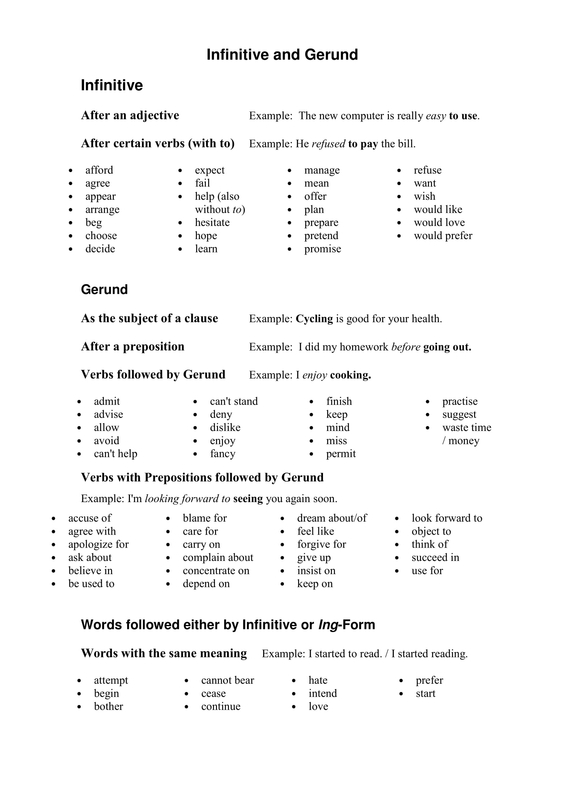 As mentioned earlier, a gerund and the present participle of a verb takes similar forms ending in -ing. And this can be confusing to people trying to learn and master the English language. In order to ensure that you make better and grammatically correct sentences, you need to know the difference between the two. You have to be able to pinpoint their differences in order to avoid masking the mistake of using them wrongly in your sentences. 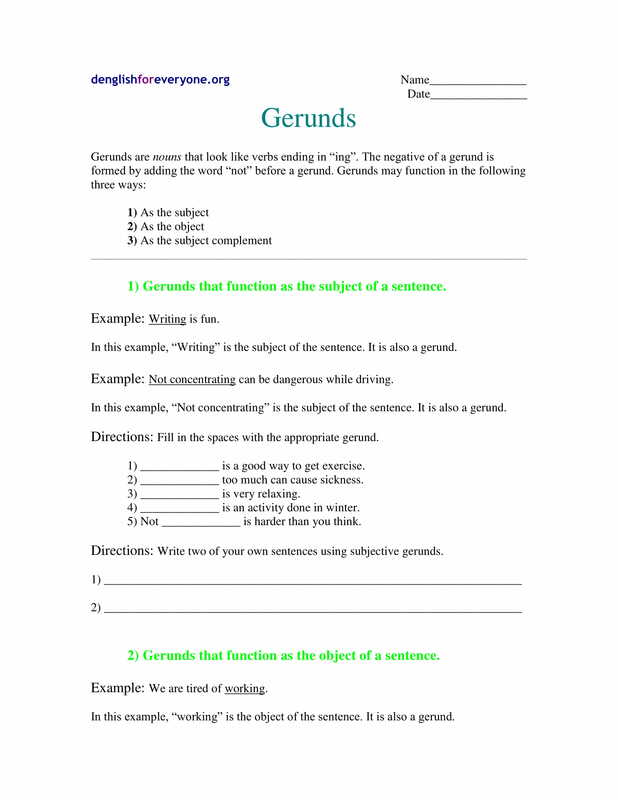 A gerund is a verb that ends with -ing but functions as a noun. On the other hand, the present participle of a verb also ends in -ing but is like a verb or adjective. 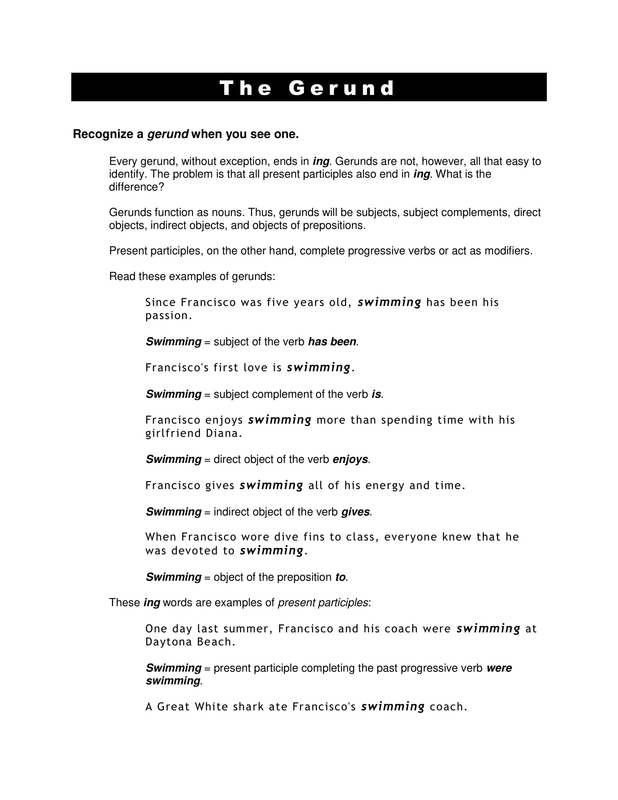 Therefore, a gerund can be easily spotted in a sentence since it takes the function of a subject. Whereas the present participle functions as the verb that expresses action or an adjective that describes the subject in a sentence. Aside from gerunds and present participle, infinitives also cause some confusion. 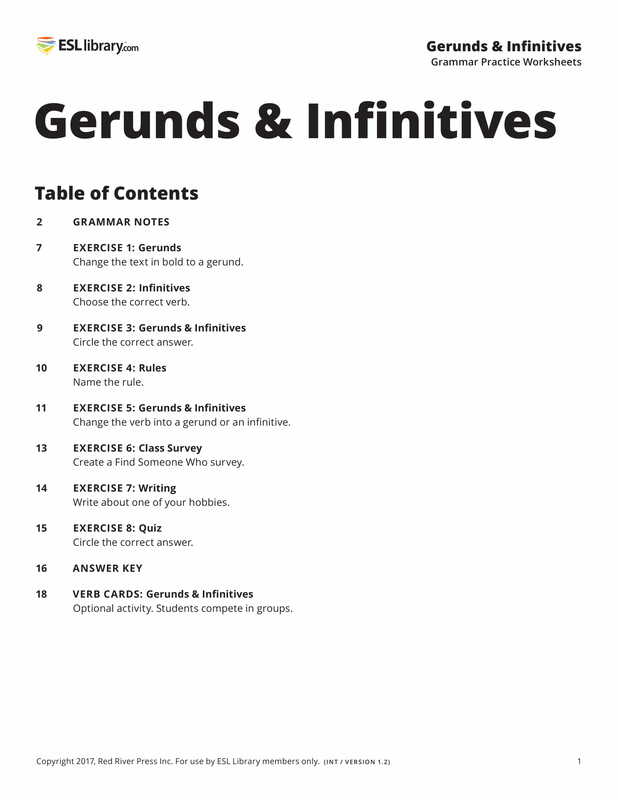 In order to save yourself from committing grammatical mistakes, it is better to get to know the difference between gerunds and infinitives, and how to properly use them in your sentences. 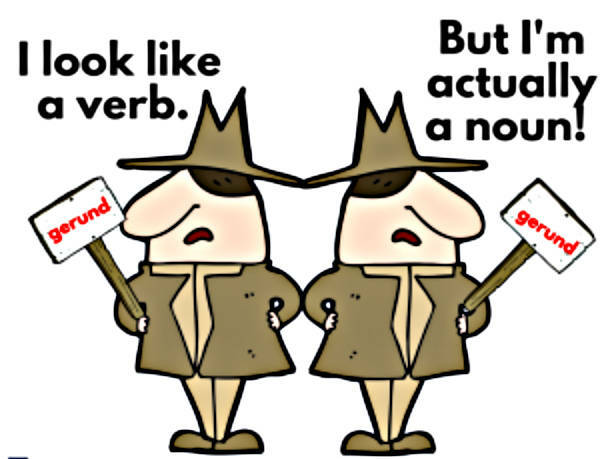 As you know, gerunds are verbs that end with -ing an act as nouns in sentences. On the other hand, infinitive phrases, more commonly referred to as infinitives, are formed with the word to in front of a verb. 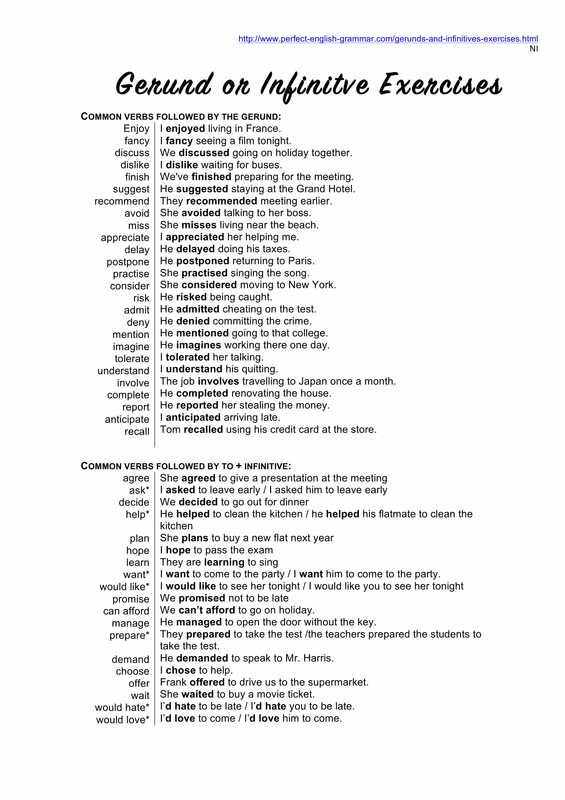 They share the similarities of being used as subjects in sentences and both can also be used as object of a verb. 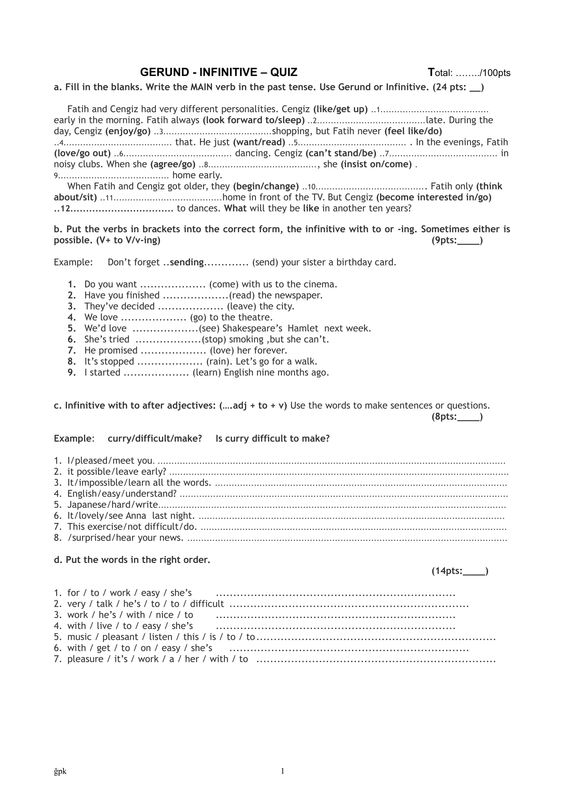 However, using a gerund or an infinitive will greatly change the meaning of your sentences. Therefore, you should be aware on how to use both of the properly. 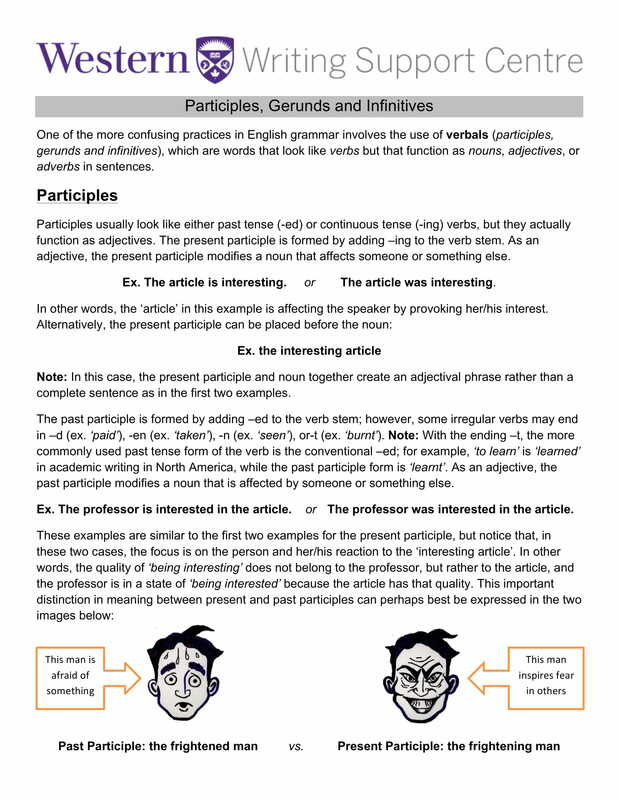 Although there are similarities, there are also differences between the two, and that is, a gerund can be the object of a preposition; an infinitive cannot. 1. The verb becomes the subject of the sentence. Speaking is not permitted in the library. Spinning is required in ballet. There is no point in talking. There is utter joy in cooking. Snowboarding is a tough sport. Sleeping should be discouraged in the office. Walking can be so tiring sometimes. 2. When the verb comes after a preposition. You should think about changing your hair color. They do their homework without complaining. The artist is interested in painting a new canvas. That kid kept on talking throughout the whole movie! Leonardo DiCaprio worked on improving his attitude. I’m looking forward to seeing you tomorrow. Thank you for buying more classes! You should really think about seeing a doctor. I started packing for my trip. I love planning road trips. One of the most important decisions we make in our lives is having kids. One of the things mothers always wait for is receiving phone calls from their children. The worst thing about a long-distance relationship is not seeing the other person regularly face-to-face. The best thing about girl’s camp was sleeping under the stars. His only activity was making music. The activity I’ll love most will be zip-lining on Mt. Fuji. She was singing her heart out during the contest. The process of getting a license is exhausting. Do you know why she is crying? He was carrying the weight of the world on his shoulders. 1. 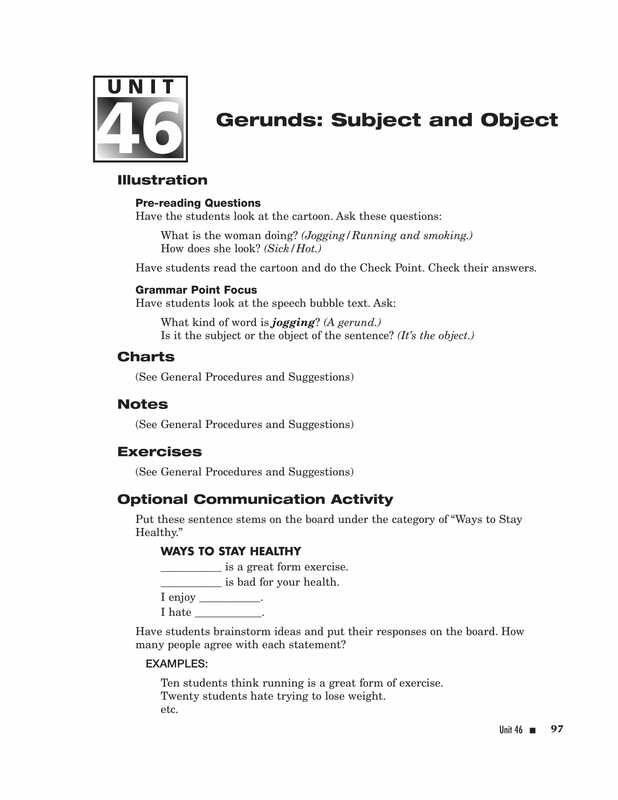 Gerunds can be used as subject of a sentence. Driving is a tiresome job. These are quotes from William Shakespeare’s literary work. The sentences are formal and poetic. However, if you look at it carefully, the words written in bold letters are infinitives (to + verb) that are used as subjects of each sentence. 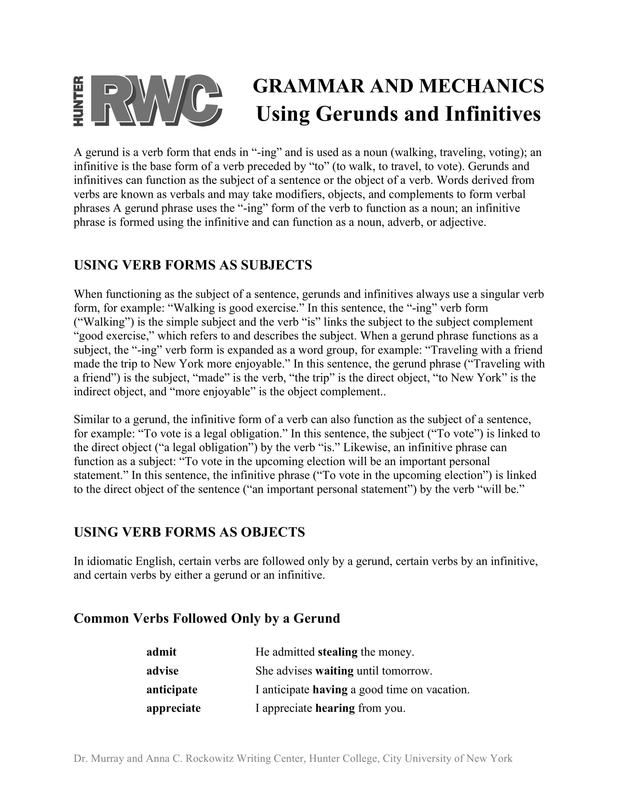 Therefore, it is possible to use both gerunds and infinitives as subject of a sentence. You only have to pay attention on how they are used to be able to identify how they are used in the sentence. 2. 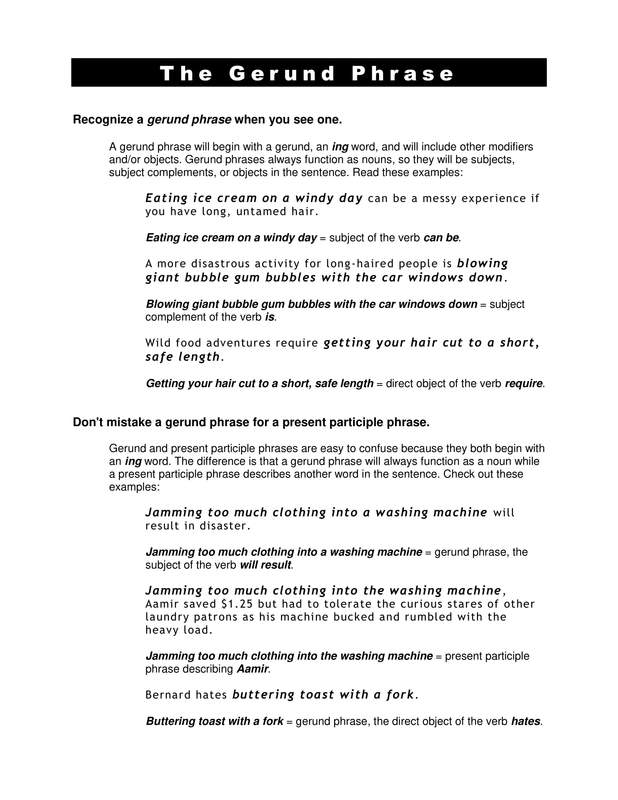 Both gerunds and infinitives can be used as objects of a sentence. They admitted changing the rules. I advise proceeding with caution. She avoided looking me in the eye. I considered staying silent, but I had to spill the beans. I denied knowing about the confidential files. The course involved writing three short stories. She mentioned seeing my father at the store. I recommend practicing guitar plucking. Don’t risk losing your life! I suggest reading more educational books. I agreed to go to a club with my friends. The representative decided not to participate in the discussions. Everyone deserves to eat three times a day. I expect to know regularization status by next week. We were hoping to avoid traffic by leaving early. He learned not to distract teachers. She needs to learn how to wash her own clothes. I offered to help my sister with her class project. We planned to watch a movie tonight. My friend promised to go with me find a gown. We seem to have lost our way. I cannot wait to see my cat. I don’t want to go home yet. 3. 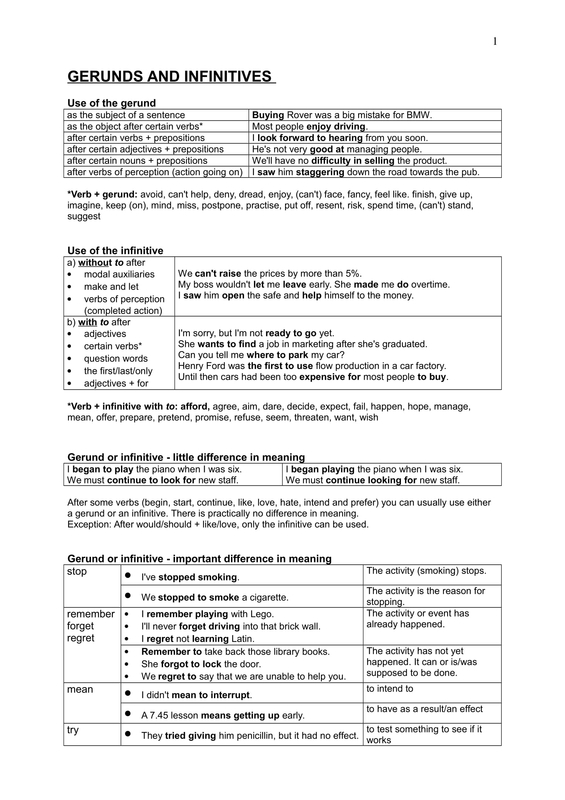 Infinitives should be used after many adjectives. It is not easy to graduate college. It is necessary to speak loudly when talking to elders. It is wonderful to have good friends. This dress is too big to wear. This car is too expensive to buy. She is too busy to care. My child is not tall enough to ride the roller coaster. The course was detailed enough to improve his knowledge about the topic. This cafe is big enough to host a small meeting. The boy is old enough to buy his own drink. The baby is strong enough to walk on their own. 4. 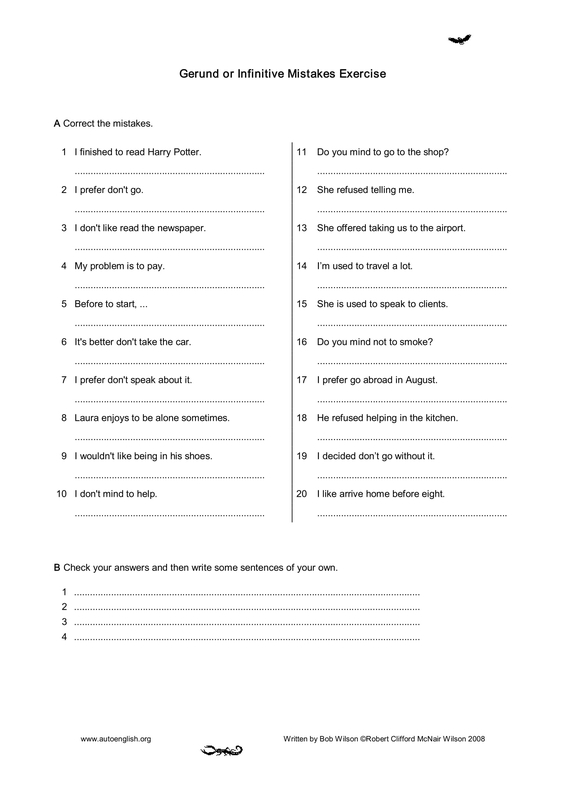 When the object of a sentence is a noun or pronoun that refers to a person, only infinitives can be used after a sentence. Can I ask you to help me finish my project? I never expected him to become so depressed. Did the company hire you just to sit in your office? I invited a friend to attend a concert. She told the child to stay at home. Please remind me to wash my dirty socks. The test required him to discern the choices carefully. She taught him to follow the rules. They urged me to continue my training. I am warning you not to do this! 5. Only gerunds are used after prepositions. When a sentence uses a preposition to connect nouns, pronouns, or phrases to other words within the same sentence, a gerund should follow it. For example: I talked her out of resigning from that job. 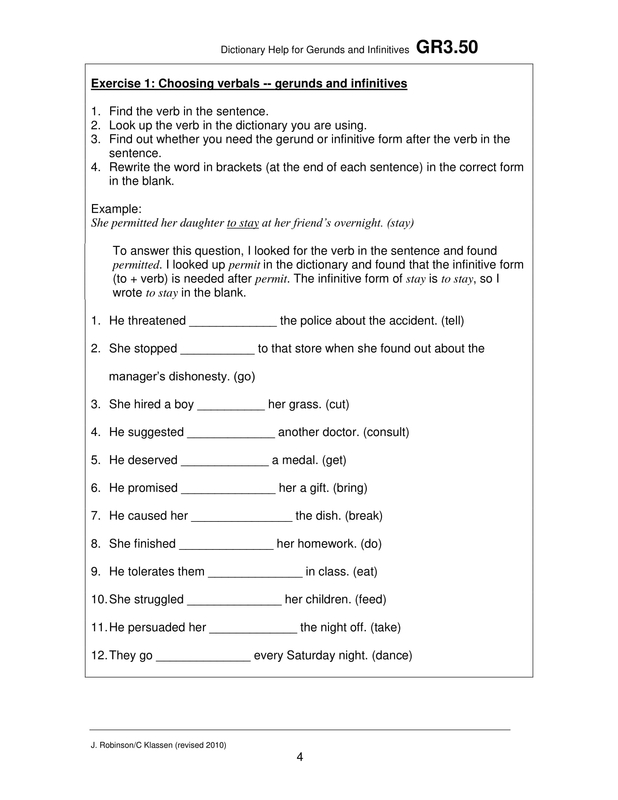 In this example you can clearly see that the gerund resigning immediately follows the preposition of in the sentence. Regardless if a preposition follows a noun, a pronoun, a verb, or an adjective, a gerund must be used after it. I had no choice but to obey him. Ana made no stops on the way except to get gas. There is nothing left for me to do but to get my purchase and go. He made sure they had nothing left to do but to plead guilty. He was capable of doing everything except to crack funny jokes. 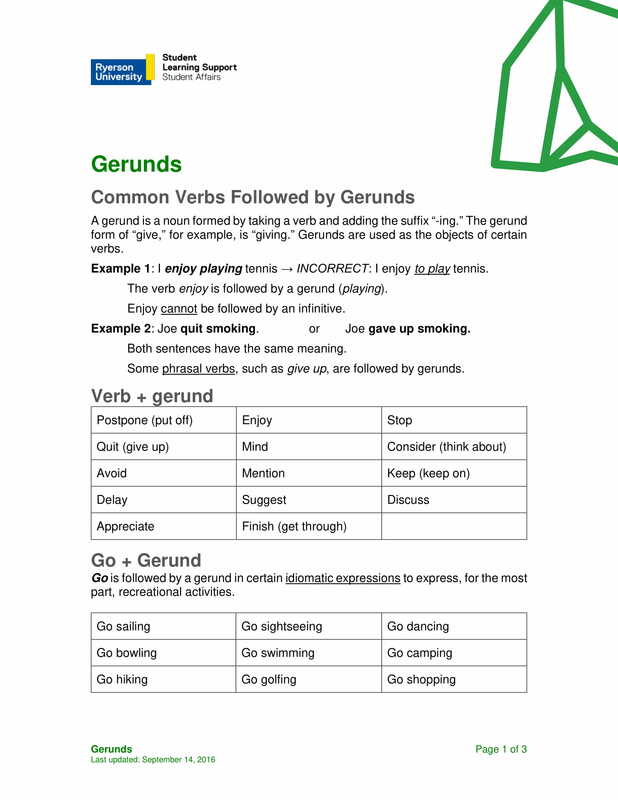 A gerund is simply a verb that ends with -ing, but it functions as a noun when used in a sentence. Unlike other words that ends with -ing, a gerund does not function as a verb. If words ending with -ing are used as a verb in the sentence, those are simply the present participle or continuous form of the verb. If you know how to clearly distinguish how words function in sentences, it will be easier for you to know which are gerunds and which are not. Knowing others aspects and components of the English language will help you make better sentences and can help you develop better overall communication skills. We hope you find this article insightful and informative.